No matter what the issue or situation is, there is always a wonderful way to support our beloved animals of all kinds! Animal energy work is often done at a distance whether the animal is at the vet or at home, since people usually prefer for their pets (and themselves) to remain comfortable where they are. Using Skype allows me to see the animal live during the session while their person can track along with the work while simultaneously observing and supporting their pet. But many sessions are done remotely just between me and the animal. For distance work, if the animal will not be visible, a photograph and exact location are requested. Emotion Code for Animals. Animals benefit from this emotional and trauma release work as much as humans do. Results seem almost magical at times, amazing their humans with the changes they see. Releasing the heart wall (if there is one) as well as any trapped trauma results in a much happier pet. Physical or behavioral problems can also shift dramatically. Animal Reiki. 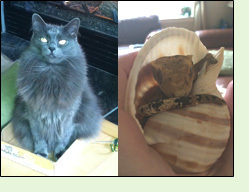 Ever since becoming a reiki practitioner in 1994 I have provided reiki to animals. It’s especially wonderful when pets must stay at the vet or in other stressful situations. As with humans, their bodies know how exactly how to use the energy best for their balance, calm and healing. Many who take my reiki training intend to use it partly or exclusively with their animals. Releasing Negative Energies. Both people and pets may acquire invisible negative energies that disrupt and deplete their own energy. Animals are extremely sensitive to these, even if their humans have one, and are more likely to actually see them than we are. One cat, Chiro, hides under the bed if his human has one. Recently the human’s pet gecko, Ike, had an attachment, which then upset Chiro too until the woman asked me to tune in and see what was wrong with both of them. Another client was extremely upset that her dog suddenly did not seem to like her. She wanted help for the dog and for herself to change whatever her dog was responding to. She had several attachments – after their release the dog was once again her friend. This experience can take a big emotional toll on animals, who may not understand why they’ve been left in such a scary place by their people, despite our best efforts to explain. I provide whatever support is needed to help release trauma and support balance through the animal’s entire stay. The plan is developed together with the pet’s people to meet both their and their pet’s needs. Here’s one example. 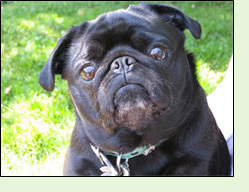 Scarlett, an adorable pug, recently had surgery to repair a disk injury that had weakened her hind legs. She was at the vet for 4 nights, from admission for an MRI through disk surgery and initial recovery. I checked in with her after she was left at the vet, during and after the MRI, during and after the surgery, and most evenings and mornings. I released trapped emotions, and provided reiki when needed. While she was hospitalized, most check in sessions ranged from 15 to 25 minutes. Once she was home again and settling in we did a longer session for her. The total overall time was about 4 hours. During a prior surgery her vets were astonished at how well she did and asked what her secret was. Shorter times at the vet naturally require less session time. Last but definitely not least, I can also support the humans as needed throughout the process. Communication. When needed in conjunction with other animal healing work, I may talk briefly to the animal about its situation, and receive a sense of its feelings to share. Since animal communication is not my professional emphasis, I am happy to refer to professional animal communicators for more complete animal communication sessions. Regular Maintenance. Some people elect to have regular maintenance sessions for their pets. An example is Chance, a once-feral cat who had many severe injuries. With time and love he became a completely domesticated loving and beloved indoor pet, but still had ongoing skeletal issues that caused periodic limping. The body code sessions had a noticeable positive effect and his person chose weekly treatments to keep him in great shape. Lost Pets. Few things are more heart-wrenching than a beloved pet getting lost. Even if a professional animal communicator can make contact with a confused, frightened animal, often the animal cannot give useable clues to where they are other than it’s dark, I can’t get out, or some other very general sense. They don’t know how to direct us. However there is one small thing I can do. I request a picture of the animal and an exact location from which they went missing, as well as their home location if different. I use online maps divided into increasingly smaller sectors, using crystals to delineate each sector while I dowse segment by segment whether the animal is within the delineated area. To my surprise this has frequently proven quite helpful. Here are some ways it has played out. A pet owner put signs in and around the dowsed area and found her dog had been rescued and the rescuer didn’t know who to contact. She saw the sign and called the owner to reunite them. Another owner got a call from a police station near the dowsed area saying her dog had wandered into their station. A friend called her lost dog all over the dowsed area telling her to go home. When she returned home the dog was waiting for her. A Canadian man's cat Buffy went missing. He searched the dowsed area repeatedly over several days without finding her, despite knocking on doors and asking owners to open any sheds where she might be trapped. As my dowsing continued to indicate she was still in the same area, he went back one more time, heard her meowing from a rooftop, and rescued her. Animal Transitions and Memorial Services. When an animal is in the process of letting go of life, energy healing is a tremendous help. Reiki and trauma release ease the passage greatly and can include support for the animal’s human guardian. Chance was a severely injured feral cat when I rescued him. The first few months that I had him, he hid constantly and would growl at me anytime I came near his hiding spot, even when I was bringing him food and water. Eventually he started to come out of his shell and explore my house, but he was so nervous and skittish. He also had a bad limp and could barely jump. Our pug, Scarlett, has had 2 major surgeries since we've met April. Both times her recovery has surpassed all expectations, even from the vet. She's been able to come home sooner than expected (saving us extra vet fees) and to emotionally recover from the trauma in what feels like no time at all. Her clearing sessions with April truly help her to process and let go of the fear and anxiety. In fact, she had one surgery before we met April which left her with a scar on her hind leg for years. One healing session with April and within two days hair grew over the scar totally covering it! It was like she was able to fully release that experience and return to her happy whole self. April is an amazing healer who has helped my pets immensely over the years. They love the many different types of energy work she does. My beautiful kitty, Chiro, hides under my bed and won’t eat if something is bothering him. Typically, within minutes of April’s work, he comes out and starts eating normally again. April also releases negative energies that may attach to me or my home. Chiro is hypersensitive to them. If he doesn’t want to be stroked and/or runs and hides under my bed, I know I must have an attachment. 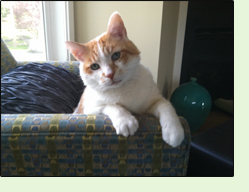 With April’s help, usually within minutes, Chiro is his loving and affectionate self again. April also works on my gecko, Ike. If Ike’s upset or sick he burrows at the bottom of his aquarium, sometimes for days. After April works on him, Ike is back up at the top of his aquarium almost immediately.